I’m helping out at my spouse’s small office and want to help configure her colleagues’ Macs with the same VPN configuration I somehow successfully set up for her many months ago. The problem is that I can’t remember which protocol I originally used—L2TP, PPTP, or IPSec—and nothing in System Preference’s Network preference tells me. How can I tell the difference? 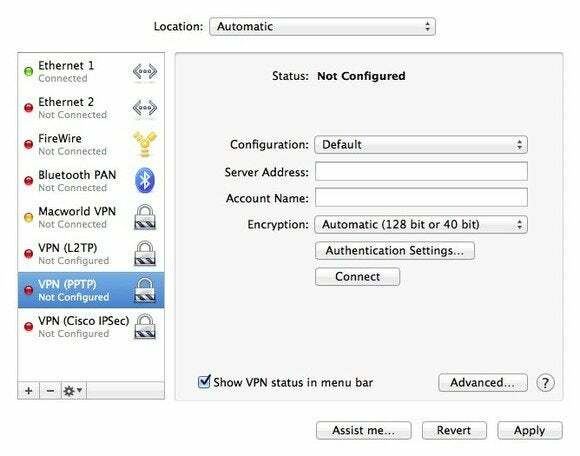 When you first set up a VPN connection by opening the Network preference, clicking the plus (+) button near the bottom-left corner of the window, choosing VPN from the Interface pop-up menu, and selecting the kind of protocol you’ll use from the VPN Type menu, the Service Name field will display the protocol in parentheses—VPN (L2TP), for example. Of course, if you change that service name (as most people would) you lose the broad hint OS X provides. Fortunately, there’s another way. PPTP connection adds an Encryption pop-up menu to those items as you can see. And when you set up an IPSec connection you lose the Configuration pop-up menu, as you can see here.